I notice you can easily flip a character in the Spine Editor by adjusting the scale to a positive/negative value, which is great! But when you've set up the legs with IK constraints, these will not flip, any suggestions how to deal with this? IK will flip just fine using negative scale. Have you disabled rotation inheritance on the lower foot bone? Doing that is common when using two IK chains for a kind of reverse foot rig. You can improve the rigging by not disabling inherit rotation and instead using a transform constraint. Often I constrain the rotationg of the foot to the foot IK target. This way the foot doesn't rotate when its parent rotates, but I can still rotate the foot by rotating the foot IK target. Yeah I disabled Inherit Rotation on the foot bone, as was shown in the IK setup video from Esoteric. But am I correct to think that this is the only way of flipping a character when animating in the Spine Editor? Yes, flipping using negative scale is the standard and only way to flip. Disabling parts of the transform is very complicated under the covers. It can often be more convenient than using a transform constraint, but may have unintuitive behavior in some edge cases. Thanks for the tip for setting up an IK leg, really useful! It seems to work, however when I set the Mix slider for the Rotation to 100, I get an offset on my other IK target. Any ideas what's causing this? In your screenshot Leg_BCK_R_IK is a child of Foot_BCK_R_IK. 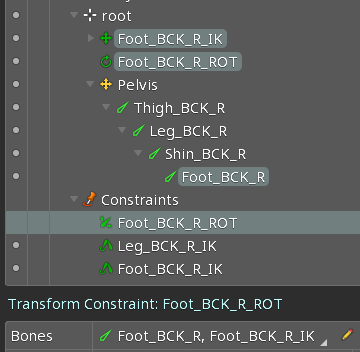 When you use a transform constraint to rotate Foot_BCK_R_IK, it causes Leg_BCK_R_IK to move. You don't even need a transform constraint to see this, just rotate Foot_BCK_R_IK directly. Look at your constraint order: you apply both IK constraints, then the transform constraint. That is why the IK bones don't point at their targets -- you've used the transform constraint to move the targets after the IK was applied. I doubt you want it to control Foot_BCK_R. Also see where I moved the transform constraint in the screenshot? The transform constraint happens first, then the IK constraints. This behaves reasonably. However, do you even need a transform constraint? You can just rotate Foot_BCK_R_IK directly. Thanks for taking the time to have a look at this! The reason I wanted to use a Transform Constraint is so I would be able to rotate from the heel, in order to be able to only rotate the foot without moving the rest of the leg. True, I can rotate using just the Foot IK target, but this acts as a Toe pivot. I've now used a different setup which enables me to animate the foot how I want to, but I needed an extra bone to do so. I usually prefer to keep my rigs as simple as possible, hence my question. But thanks for all the help!